The Chicago Renaissance began in the early 1900s and lasted until approximately 1930. The leading writers of the period—including Theodore Dreiser (Sister Carrie), Sherwood Anderson (Winesburg, Ohio), Edgar Lee Masters (Spoon River Anthology), and Carl Sandburg (Chicago Poems)—focused on the increasing industrialization of American society as well as the loss of traditional rural values and their accompanying romantic ideals. The period also marked the emergence of journalism as a literary medium. The magazines Poetry, founded by Harriet Monroe, and Little Review, founded by Margaret Anderson, emerged at this time, as did the Little Theatre. All provided outlets for new and experimental voices that moved beyond the regionalist style of the late 19th century to explore realism and naturalism. 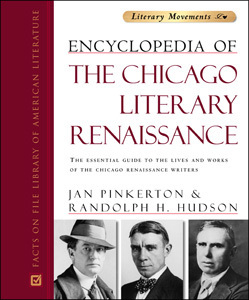 Encyclopedia of the Chicago Literary Renaissance is the only comprehensive reference to this important American literary movement and the writers and other major figures associated with it. Containing several hundred authoritative entries covering all aspects of the Chicago Renaissance, this A-to-Z encyclopedia provides a detailed look at a group of writers and poets with ties to Chicago whose influence spread throughout the United States and whose visionary works revolutionized American literature in the early part of the 20th century. The book also includes 35 black-and-white illustrations, a chronology, a bibliography, cross-references, and an index. Many terms and other items of interest to students of the Chicago Renaissance. "...a welcome addition to any reference shelf...Highly recommended." "This encyclopedia is valuable for being the first on this important literary movement, and for its comprehensiveness and good organization...recommended for academic and public libraries." "...useful...Considering this work’s uniqueness...large collections, particularly in the Midwest, will want to consider it." "...an excellent source that introduces students to an important literary movement. This is a major new reference title that academic and public libraries with literature collections will want to purchase."